The Grateful Dead Folktale: Questions? Cendrillon illustrated by Annette Marnat was released last year in France. As always, I love the European editions of fairy tales that provide illustration styles we don't see very often in the U.S. Marnat--whose blog you can visit here--has a style very reminiscent of the mid-20th century, The cover image made me think of Gustaf Tenggren and some other artists that I cannot remember the names of this morning, such as some of the Little Golden Book illustrators. Princess in Disguise: A Tale of the Wide-Awake Princess by E. D. Baker is released this week in both the US and UK, see Princess in Disguise: A Tale of the Wide-Awake Princess: UK Link . This is the fourth book in the Wide-Awake Princess series which has offered some other fairy tale retellings. I am not sure which fairy tale provided the primary inspiration, if there was one, for this new book. With the help of family and friends, Annie and Liam's wedding day looks as if it's going to be perfect until everything starts to go wrong. Liam's father doesn't show up, nor do the magic-wielding guests. Members of the wedding party come down with strange afflictions, Annie's gown is ruined, a storm floods the castle grounds, and an unknown king lays seige to the castle. Queen Karolina decides that they need the help of her fairy godmother, Moonbeam, but a pea-soup fog keeps the messengers from leaving. Only Annie and Liam can get past the magical fog to find Moonbeam, but even after they find her, it’s up to them to discover who cast the spells that ruined the wedding, and why the unknown king wants to conquer Treecrest. Okay, you have to click on this one to make it larger and see all of the glorious detail--and the full uncropped image since it is cropped in this post. These have been sitting in my photo file since Christmas. So it's time I shared them for Art Thursday. 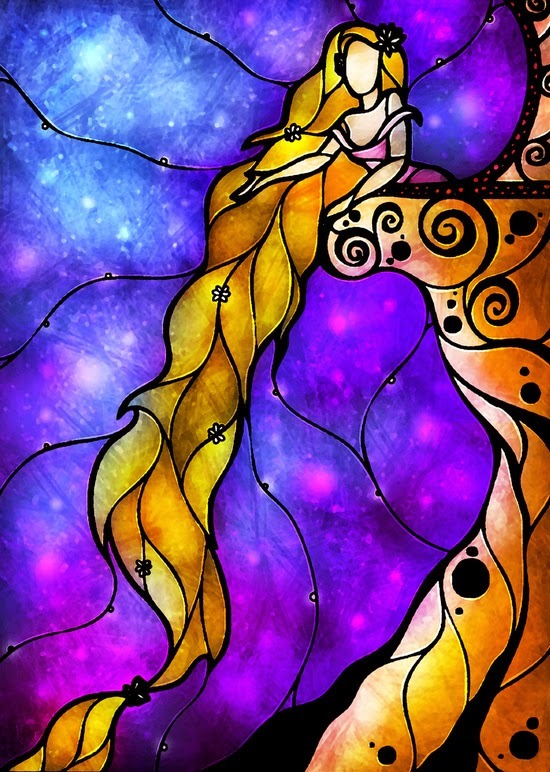 I discovered Mandie Manzano on Society 6 when looking at iPhone case designs. Her work resonated with me immediately despite the definite Disney influence on several of them which is not a selling point for me. Needless to say, my favorites are those with these least Disney influence, my personal preference and catnip. 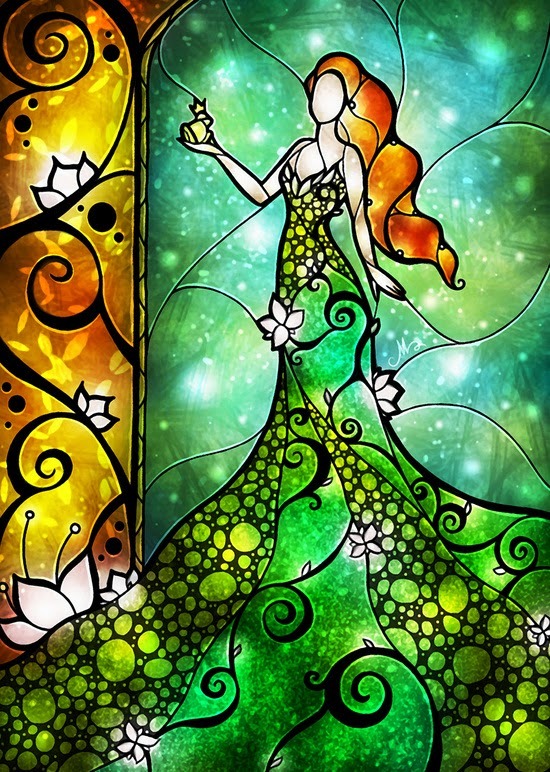 Simply said, I adore stained glass windows and these illustrations simply shout for stained glass. I am still debating which image I will choose when I make a purchase, for I will need to at some point. The following tale is one of the hundreds that appear in Cinderella Tales From Around the World . It is a short and much less sweet Cinderella tale from Greece. 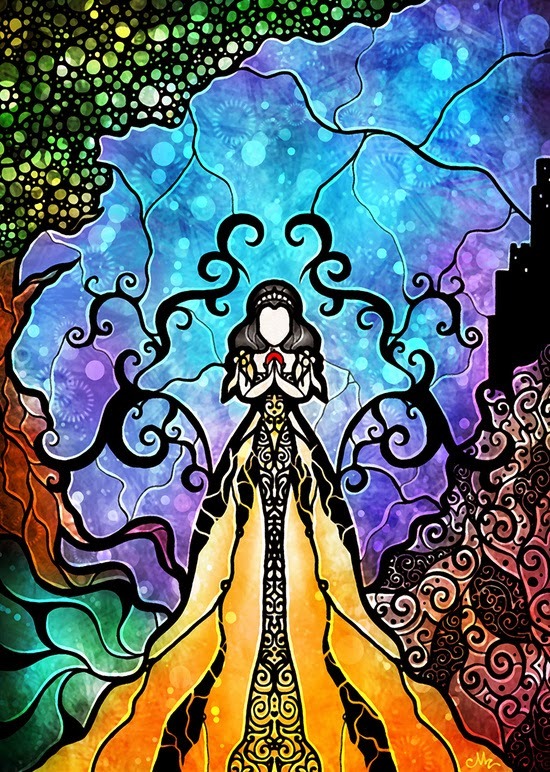 Greek Cinderellas often have mothers murdered by Cinderella's sisters. I've been seeing this mentioned in articles around the web and thought I would share an example of it here. The tale is also like a majority of Cinderella tales where she meets the prince at church instead of at a ball. THERE were three girls sitting spinning with their mother, and they agreed that whosesoever thread broke first they should kill and eat. Their mother's thread broke, but they said, “Let us spare her for having carried us in her womb,” and went on spinning. When the mother's thread broke a second time, they said, “Let us spare her for having suckled us from her breast.” But when the mother's thread broke a third time, she had to be killed. The two eldest killed her, cut her up, cooked her, and eat well of the flesh, but the youngest would not join them, and when they had finished she collected the bones and put them in a large earthenware jar. Every day for forty days she incensed them. After forty days she went to the jar and found within it three dresses (one, the plain with its flowers; another, the sea with its fish; and the third, the heaven with its stars), and a pair of beautiful slippers and a splendid horse. On Sunday she put on the first dress and went to church. There the king's son saw her and fell in love with her, but she ran away before he could catch her and speak to her. So it was the next Sunday, when wearing the second dress she came to church again. On the third Sunday she put on the third dress. As she was returning from church she stopped to let her horse drink, and one slipper fell into the drinking-trough. The prince, who was following her, stopped his horse too, and it was frightened at the slipper, and would not drink. So he saw the slipper and knew to whom it belonged, and went round to all the houses in the town trying to fit it. The eldest sister had put the youngest under a basket, and on this the prince sat down to try the slipper on. It would not fit them, and he asked them if they had no other sister. They said, “No,” but the youngest took a pin from her hair and pricked him with it, and so he lifted up the basket to see what was under it. 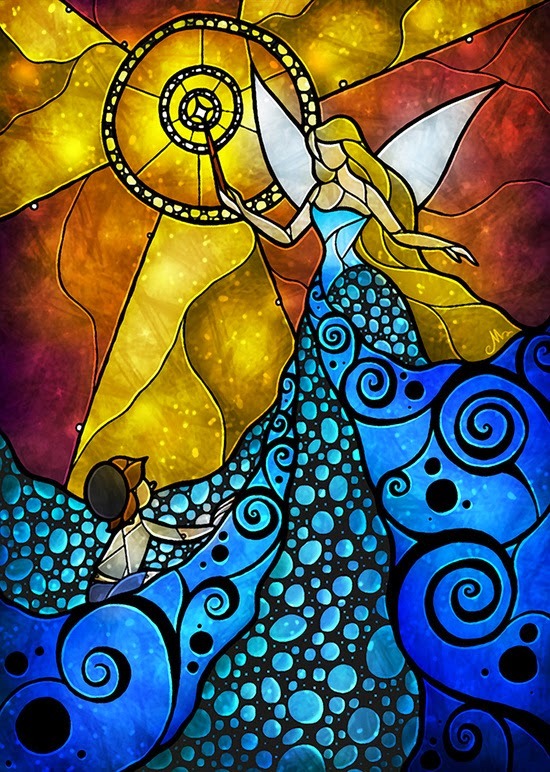 When it was lifted, the eldest sister said, “She is a poor outcast, our servant, whom we put there that you might not see her.” But the slipper fitted her, and the prince recognised her, and they were married. Time for a Cinderella themed Sunday Funny. This one is all over the web in several permutations (granddaughter, niece, daughter) and I don't know who first thought it up, but this was my favorite image found at SomeECards. That's my kind of Cinderella party! Don't think the Kensie niece would enjoy it though. An early pregnancy is no fairy tale. Okay, another hard hitting ad using fairy tales about a social issue. Interesting. Reminds me of the student and other projects we see like this so often about "real" princesses. 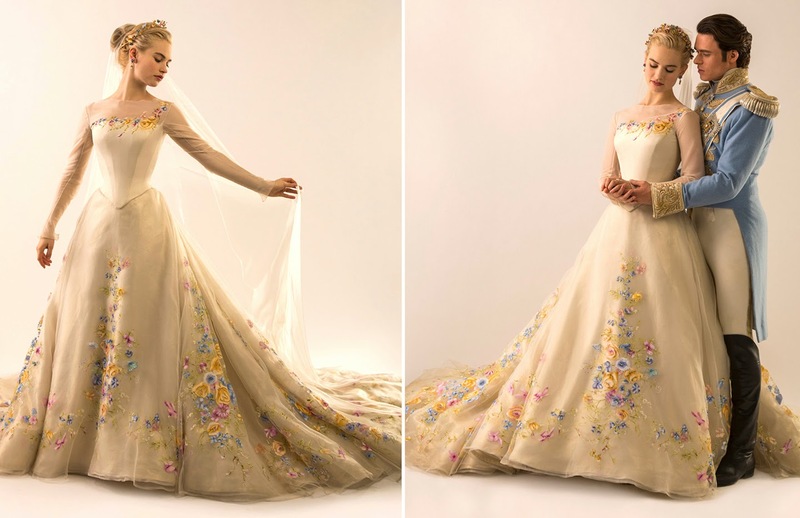 Cinderella 2015 Wedding Dress, images from Vanity Fair. Yesterday I saw the new Disney's Cinderella film, what was essentially a women's ritual in my immediate family that included my sister, her daughter (my five-year-old niece), my mother, and my sister's mother-in-law. I love all of these women and between all of us we have a very diversified relationship with Disney and its products. I am really not in the mood to write a review. I've thought about the film, yes, but analyzing it for its story is almost pointless. 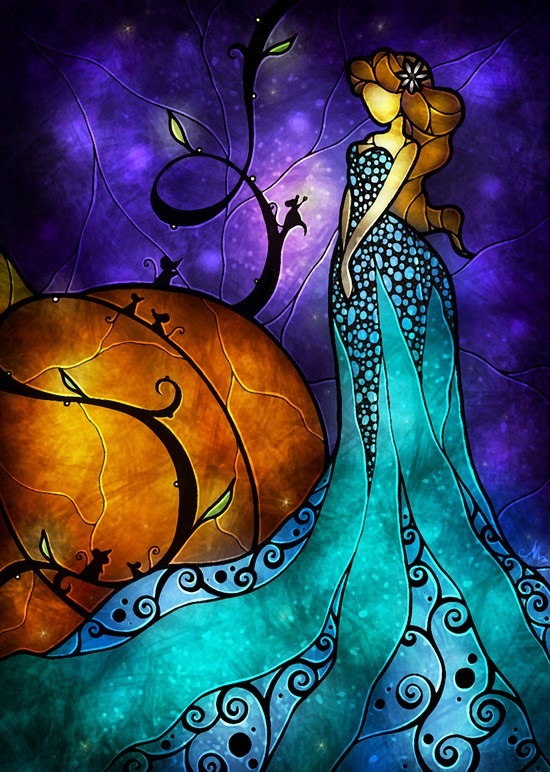 There is some, but not much, that diverges from the original animated Disney's Cinderella. The acting was fine, the sets were beautiful, the costumes were overall stunning. I will not forget Cinderella's wedding dress which was much more elegant and less little girl's dream than Cindy's ballgown which was just a tick or two below over the top ridiculousness. Really, it balanced on the precipice. I imagined the laughs they all had when shooting the dance scenes trying to choreography with and around that skirt. I see a new trend in wedding dresses either way. And the costumes in the early idyllic life scenes were making me long for spring in ways I haven't quite had time to do yet this year. The rest of the women in my group loved the film to varying degrees, with little Kensie the most enthusiastic. She proceeded to dance and dance and dance at the bottom of the theatre steps after the film, a mix of romantic and pent up energies after sitting for too long energies since there was once again a plethora of previews before the film that lengthened it by too much by far, nevermind some that were not appropriate for the youngest audience members. But I digress. And am reminded of why I prefer home viewing of movies anymore. And then there were the first three trailers and commercials that were played without picture, just sound, until I got up to find someone to fix the problem although we were far from the only people in the theatre. I was amused and wondering if anyone would go and didn't even hear any conversations to that point, my innate observer tendencies entertaining me much more than any trailer could. But I was there for Kensie so I went and found someone to fix it for us. My favorite line in the entire movie? "I speak French, not Italian." Only gotten in context but my only genuine surprised laugh. Most of my entertainment was from watching Kensie watch the movie. 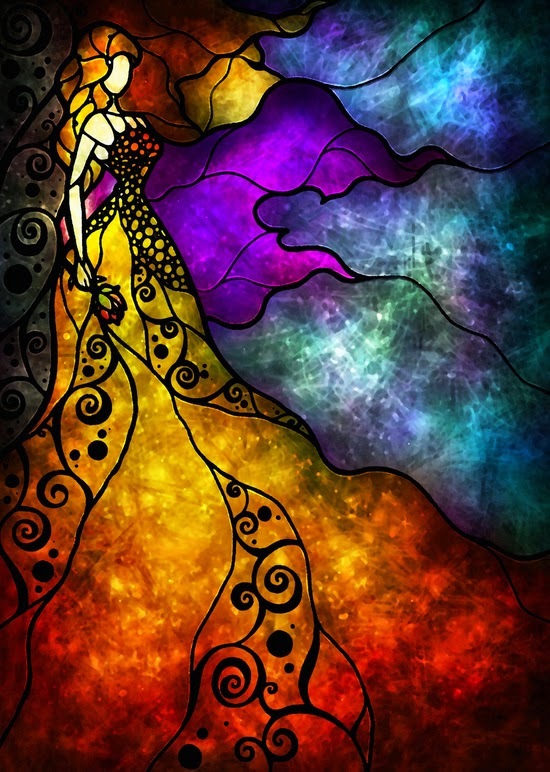 She is a princess incarnate and loves all of these fantasies and has a rich imagination. She also is getting other tales and stories and I am far from worried about her romantic expectations of life. She is a child who has only grown happier over the years as she has gained more autonomy. If there is a child who has hated being a child and the lack of control of her life it offers her, she is it. But she has a rich fantasy life that gets her through her frustrations where she grows up to be Queen of the Universe with many superpowers. And she firmly got the message that courage and kindness are much more important than beauty although in this movie, let's face it, beauty is a commodity as well. 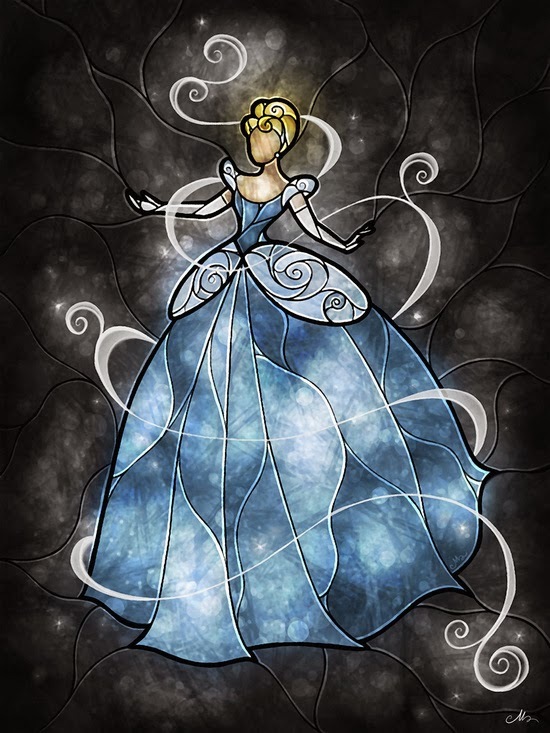 My mother pointed out that the real princess is beautiful, too, just the physical antithesis of Cinderella. The Prince prefers who. That said, the few story changes that are there were richly borrowed from both Ever After and The Slipper and the Rose. The conniving stepmother is very much Ever After. Cate Blanchett did amazing things with her lines and never chewed the scenery. I would love to see what she would have brought to Ever After, although I've always been satisfied by Angelica Huston's performance in that. The "you must marry a princess" politic were much more The Slipper and the Rose, but not as heavy handed and never felt nearly as threatening to the ending as they do in Slipper. But I admit as I compared it, I longed to watch Ever After again. There is a richness to the characters in that one while these characters only ever stayed flat for me and suffered by comparison. I liked this Cinderella just fine, but I didn't see growth in her, just an abiding patience which I am all for admiring--not all my heroines need to be Agent Carters or Wonder Womans or even Annas or Elsas--but it didn't give me much to see or explore beyond that one level, there wasn't a real struggle for her and her justified pain was nearly invisible relative to the level it deserved. Overall, this is a perfect Disney product. It delivers exactly what it promises. There is nothing new here, but it is pretty and entertaining and will delight millions as it should. And it is very pretty, very, very pretty. I love pretty and this makes great wallpaper. On the Road with the Archangel by Frederick Buechner is on sale for $.99 in ebook format. 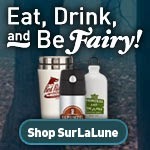 Unusual SurLaLune offering you think? Well the book is based on the Book of Tobit from the Apocrypha which is also one of the earliest, if not the first, Grateful Dead stories recorded, over two millenia old. You're going to be innundated with Grateful Dead on this blog soon, so here's a chance for an early start. That said, this title is one of hundreds currently on sale on Amazon (and probably elsewhere), a few with some fairy tale connections, but also just a lot of great books. Here are links to the lists which I am still mining myself for treasures--There is lots of Terry Pratchett (who we lost this week) and Deborah Crombie and many romance authors, including some fairy tale inspired romances, like The Princess and the Pea and The Emperor's New Clothes by Victoria Anderson and The Viscount Who Lived Down the Lane: Rhymes With Love by Elizabeth Boyle, a Beauty and the Beast romance. There's more but those are the ones with tabs I opened. Hailed as "one of our most original storytellers" (USA Today), Pulitzer Prize-nominated author Frederick Buechner has written an extraordinary new novel that shines with the mystery and wonder of the divine.Drawn from the ancient apocryphal Book of Tobit, On the Road with the Archangel unravels the tale of a eccentric blind father and his somewhat bumbling song who journeys to seek his family's lost treasure. Narrated by the wry and resourceful archangel Raphael, Buencher's tale is a pure delight, alive with vivid characters, delightful adventures and wondrous revelations. The following tale is one of the hundreds that appear in Cinderella Tales From Around the World . So she did as she was bid. She wanted to go to a party. Dress and horses and all came to her, but she was bound to be back before twelve o’clock or all the enchantment would go, all she had would vanish. The sisters they did na’ like her; she was so pretty, and the stepmother she kept her in wretchedness just. She was most lovely. At the party the Prince fell in love with her, and she forgot to get back in time. In her speed a-running she dropped her silk slipper, and he sent and he went over all the country to find the lady it wad fit. When he came to Ashey Pelt’s door he did not see her. The sisters was busy a-nipping and a-clipping at their feet to get on the silk slipper, for the king’s son he had given out that he loved that lady sae weel he wad be married on whaever could fit on that slipper. The sisters they drove Ashey Pelt out bye to be out of the road, and they bid her mind the cows. They pared down their feet till one o’ them could just squeeze it on. But she was in the quare agony I’m telling you. So he rode back and found her among the cows, and he married her, and if they lived happy, so may you and me. This is mostly a repost of a blog entry from several years ago. With Disney's new film, I have Cinderella films on the brain and several of my favorite fairy tale films are Cinderella inspired and The Slipper and the Rose: The Story Of Cinderella [Blu-ray] is one of the top five for me. After all, barring the animated Disney features, this was my very first fairy tale film. And for years I knew virtually nothing about it, even its title. Here is a passable movie trailer made by a fan, so I thought I would share it here.